Sussex Police said an alert from a member of the public resulted in the arrests of two men and a boy on suspicion of drug dealing in Brighton City Centre. The two PCSOs were patrolling in New Road on Thursday, March 7, when they were alerted by a member of the public who said that they had seen three people dealing drugs. They investigated and called up prevention officers for support. Police said: "Once the suspects saw the officers, two of them ran off and discarded a bag. They were arrested and one of them was found to be in possession of £3,000 cash. "The PCSOs searched the area and found the bag which contained a knife, a significant quantity of class A drugs and cannabis. They had also taken a photo of the third suspect who had evaded police and was later arrested in the city centre. He was found to be in possession of a knife, class A and class B drugs which he had concealed in his trousers. "A 24-year-old man of no fixed address was arrested on suspicion of two counts of possession with intent to supply class A drugs and Class B drugs, possession of cannabis and possession of an offensive weapon. A 25-year-old man from Portsmouth was arrested on suspicion of being concerned in the supply of cocaine. They were both released on bail until April 3. "A boy aged 17 from London was arrested on suspicion of two counts of possession with intent to supply class A drugs and Class B drugs, possession of cannabis, conspiracy to supply class A drugs and possession of an offensive weapon. He was released under investigation." 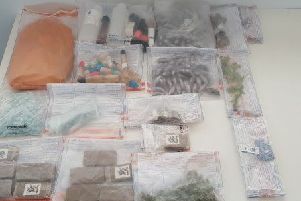 Inspector Nick Dias, city prevention enforcement office, said: "We are continually working to make Brighton and Hove a hostile place to deal drugs. This was a good example of our PCSOs acting on information given to them by the public and alerting officers to make an arrest while also gathering evidence. They are a key part of our prevention teams helping to prevent crime and protect the vulnerable."